And I'm ready for my close-up! I'm at Craftsy filming another class this week! 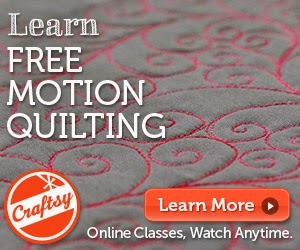 If you want to check out my earlier Craftsy classes, use CLICK HERE to find the links to get $20 off each class. Stay tuned for another announcement when the class is released. 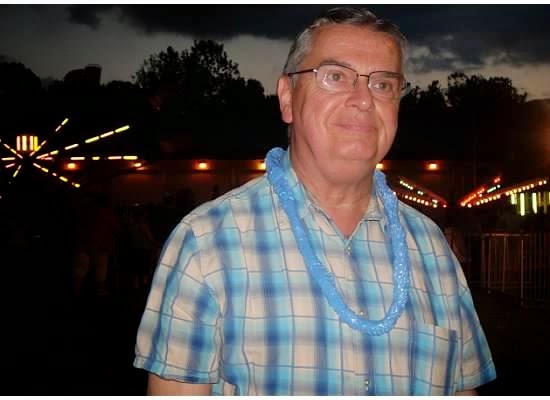 This is my second Father's Day without my Dad. Grief comes at weird times. It hits when I see a fancy Christmas ornaments because Dad obsessed about his Christmas tree. Seriously. He took such joy in re-arranging all of the ornaments (every. single. day). I get happy and then sad when I see a mixed nut selection and think "I need to buy this for Dad." Dad was always hard to buy for (really, Really, REALLY hard to buy for) but mixed nuts were a sure bet! I frequently listen to audiobooks. When I'm quilting my fingers to the bone preparing for some super-secret quilting events, I listen to an average of one audiobook per day. Most books are entertaining enough to keep me quilting and for that I'm grateful. It's a happy occurrence, then, when I read a book that instantly makes my heart sing. The combination of the finely crafted words, the narration, and (for me) the smart humor keeps me listening while whispering to myself "Please be true. Please be true." My biggest fear is that this "Oh my heck I love this book more than oxygen!" feeling will be ruined by the book not finishing as strongly as it started. 1. The Count of Monte Cristo by Alexandre Dumas This book was a "Why have I never read this before?" book. It was long and I savored every single word. I will definitely read this again. Have you read it? My advice: read the book, skip the movie. 2. The Martian by Andy Weir Geeky. Smart. Fantastic. I could spend all day writing how I feel about this "You have to read this!" book. The World's Strongest Librarian by Josh Hanagarne It's a memoir about an LDS strongman librarian with Tourette's syndrome. That sounds like a lot of things to be, but this book and its author are so much more than that. The author is a smart, funny man full of heart and hope. READ. THIS. BOOK! A student blogged about my More or Less Quilts lecture HERE. I posted a bunch of fun photos on InstaGram (@debbybrownquilts). If you have never been to Handi Quilter Academy, put it on your "must do" list! I'm already dreaming and scheming of the new classes I want to teach there next year. Will I see you in Utah June 22-24, 2017? Some of you may know that I tend to have a higher than average number of travel horror adventures. I've been stuck during hurricanes and blizzards and the Polar Vortex. I've had luggage lost and luggage memorably destroyed. Traveling home from Salt Lake City yesterday, however, I had a new-for-me travel adventure: Emergency Vehicles. Many times, my plane has been met by an ambulance to care for a passenger who became ill during flight. This was different. My flight took off from Detroit and headed to New York. Once we reached altitude, the pilot informed us that there was a mechanical problem and we'd have to turn back to Detroit and should expect to land in seven minutes. A few minutes later the pilot announced that we would not, in fact, be landing shortly; instead we would fly around for a while to burn off our fuel. When we had used enough fuel to attempt to land, we landed on a runway lined by emergency vehicles. It was odd seeing all of the emergency vehicles in place for a plane that I was on and I think I'm glad that I didn't hear all of the conversations between the pilots nor their communications with the airport. Less information is definitely more. The pilots, flight attendant, emergency crew, airline, and airport all worked together well. We landed safely, were promptly boarded on a replacement plane, and I was home less than 3 hours late! I succumbed to my travel exhaustion when I finally got home but am hard at work this week on top-secret quilting projects. I will be quiet this week, but expect a fun announcement next week!